I mentioned a few weeks back that I was involved in a new sewing project. Well, it's all done now and I can proudly show some pics of my new cushion covers in situ. 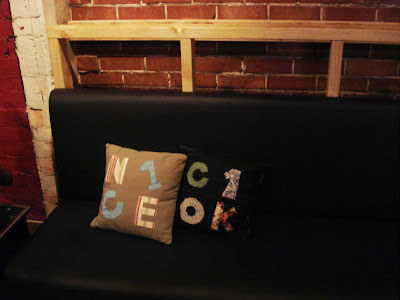 They are sitting in C1 cafe in Christchurch, on what is a new bench seat. They look pretty good I think and their new owners seem very happy.